Vintage Interactive is a powerful encrypted cellular platform for your security system so that it can communicate without phone or internet connections. Learn more here. This encrypted connection to our monitoring station eliminates the need for phone lines and Internet connections which are vulnerable to cutting from the outside of the home. It allows for faster communication of the security system so that the authorities can be alerted sooner. 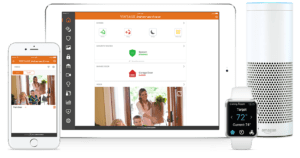 It allows you full control of your security system from anywhere in the world through your smart phone or a host of other internet connected devices. Integrated video enables you see your home from anywhere on a secure connection that is encrypted to try to prevent others from hacking your video unlike other camera systems. 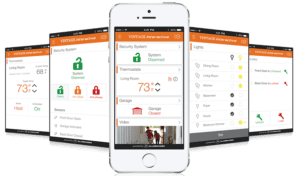 Integrated home control including locks , light controls, thermostats, garage door controls and other devices can be added to make your home a truly smart home on a wireless encrypted connection, unlike similar services.